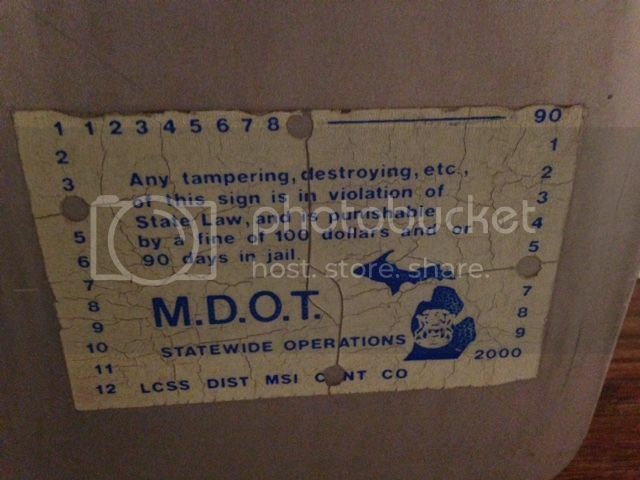 US 127: This is off an overhead guide sign and has 45x36 dimensions. I have I-75, I-69, US 13 and US 24 all in 36x36 form but the three digit 127 made this the largest sign I have. There is actually a surprising number of rivets still on the sign itself. AZ 143: Kind of an odd bird with the Sky Harbor Expressway considering it is only about 4 miles long. 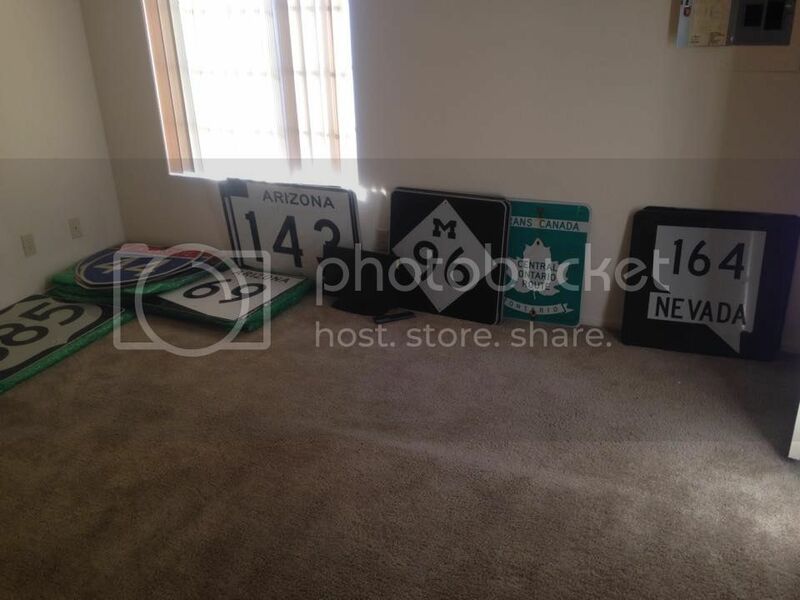 I got a whole mess of AZ stuff from the same guy; AZ 69, AZ 195 and AZ 202 off the top of my head in addition to some Nevada on top of New Jersey signs. I-44: This is the last of the US 66 Interstates that I needed and the closest collection that I have to "complete." I'm just looking for a I-66 and I-85 at this point. Basically I try to collect routes that have some significance like places I've lived before, worked, spent a trip or had some sort of scenic value. Generally I try to avoid duplicates but sometimes I'll grab a couple vintages if the price is reasonable. Figured this would likely be something that people here participate in, I know that there are some traffic control people on here. I have a few road signs. 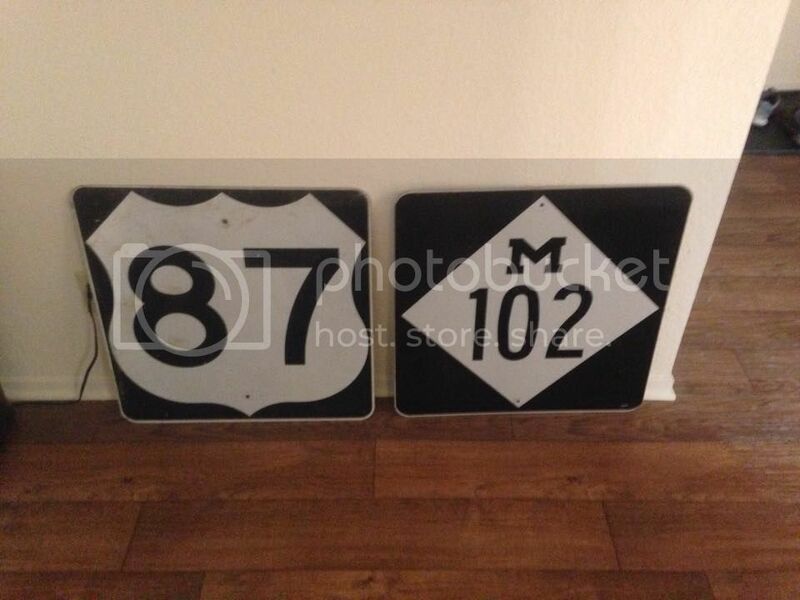 Thinking about picking up a route shield as I don't have one yet. I also have several traffic lights. I have a couple of road signs (no route shields yet) and an old traffic light. Always on the lookout for more, and especially old gas/oil signage (although that stuff is popular and is harder to find or afford). I mostly look for that kind of thing in antique/consignment type shops and not much on the internet - usually because I'm not purposely looking for something and just stumble across it. Thank you American Pickers for making sure no one out there is left unaware of the value of the old signs sitting in their shed. You know, it's funny. I see a crap ton of route signage on their picks off in the background but they NEVER ever touch on it. Just goes to show how far route signage is being gas & oil in terms of popularity. There is one episode where they inquired about a Miss 1 cutout but were told it was not for sale. See this post I made about it on May 29, 2012 with a couple of screen shots of it. 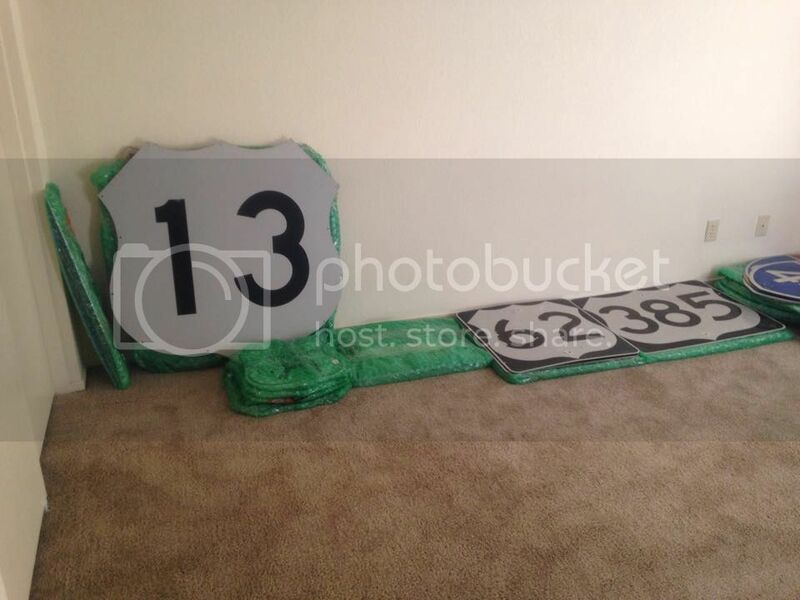 I have retired traffic signals from Mobile, around 200 license plates and over 60 shields in my collection. The signs range from old cutouts and outline shields to more modern shields and Jake-based reproductions. I can't say I've watched the show absolutely attentively but I'm surprised that I missed that one, that's a nice embossed sign. Most of mine are modern signage but I have quite a bit of the vinyl era cut-out US Route signage...embossed isn't really the place to go for deals. I picked up a lot of replicas of embossed signs a couple years ago from a guy out of Oregon steel prices were a lot lower. 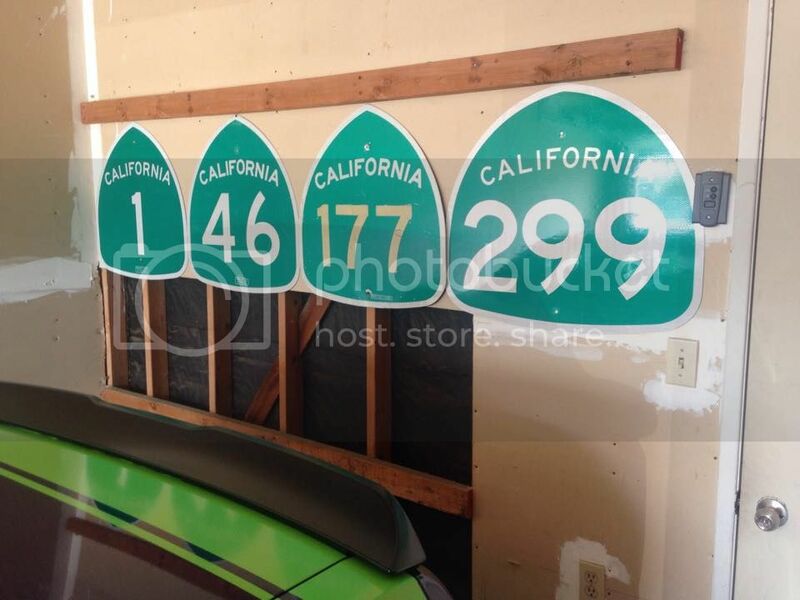 I've had a couple run-ins with Jake over the years, seems like he's still going on eBay with the California stuff. Wasn't he supposed to be on here as well?...say that Agent Steel on that thread you showed me. The CA 60, US 666 and Yellow Florida US 301 really caught my eye in there. I've never once seen a CA 60 in my travels despite California stuff being fairly common, the US 666 had a nice DOT sticker and it's very rare to see anything but the colored US 1 out of Florida. I have 2 traffic lights and a Ped signal I can program using my Christmas Light programming equipment, which via the computer allows me to accurately duplicate what one would see at a regular intersection! All three my shields came from Jake. 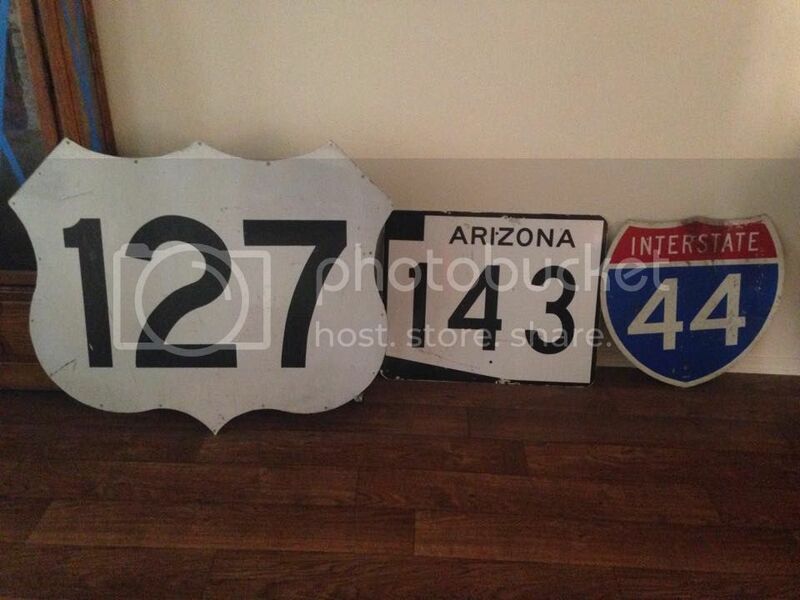 A US 101, a CA 14, and a custom-made I-366. 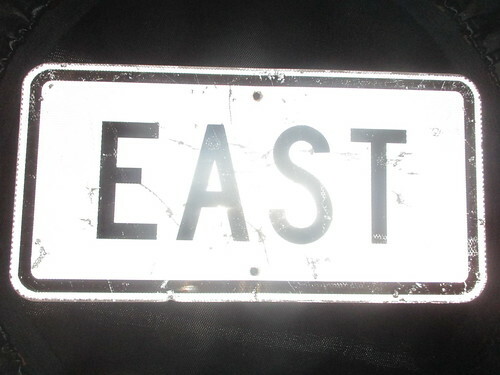 I also have a handful of disused local signage. A couple of street blades, a stop sign, and a 70s vintage speed limit 35. I have 3 from Jake: Cutout/ refurbished AR 68, AR 471 cutout, Business US 71 cutout. I have another AR cutout (23 original), MO cutout, IL "silhouette", numerous Kansas mini replicas, plus 3-4 signs in storage. I'd love to get a couple more, but money is tight right now. I do have some street blades also...but very few. All of them except one consist of US Highway route number like US 176 or US 90. 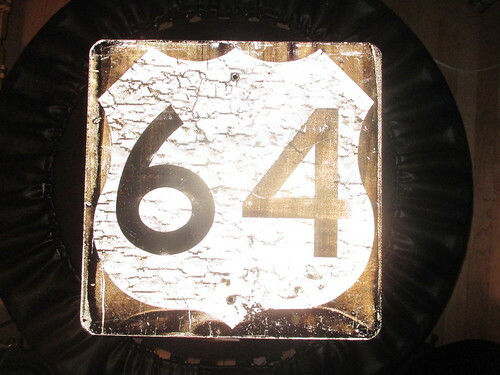 My personal favorite is an Oatman Highway sign I picked up this year which was part of the original US 66 in Arizona. It's got just the right amount of wear that it hasn't affect the font but the green has basically faded into almost a weird black. Also, I have three signs on the way...made a deal with a scrapper in Michigan and bought something from another one out in Texas. I'll show them when all three arrive...one of them is something I've been wanting for awhile. You just got to find the guys who start with a low entry bid or a scrapper who knows what the real value is with BIN prices. A lot of people have really common signs but think they are worth a fortune and ask for a big number hoping for big day. Best advice I can impart is just have a list of what you want and what you're willing to pay for it. 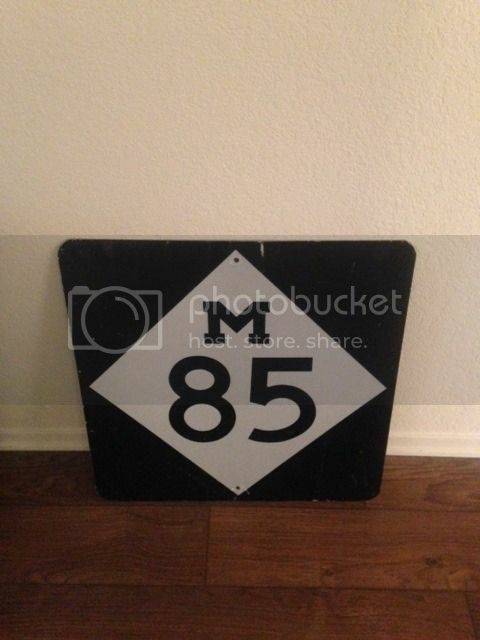 Canadian signs are little more rare to come by but you might want to look at someone like lucky_cat_1958 who usually has a lot of them and starts his bids roughly at market value. Really the only Canadian stuff he gets that goes for decent money would be Autoroutes from Quebec. This is a good price, IMO. What you might do is set up an e-bay search where you can see what's available and for how much. And get a really good list of sellers you follow. I have 32 that I follow which usually are pretty fair traders. You just have to ignore the crap high dollar posts and sellers like I listed in the "clueless ebay user" thread. Picked up the US 87 due to my recent trip where I followed a large portion of the I-25/US 87 multiplex between Denver and Billings. The real prize here is the M102 or as most people would know it as 8 Mile Road from Detroit. Now for me it was a place where my father worked in the 1980s on 8 Mile west of I-275 and where my Grand Parents lived at the crossing at Grand River. Surprisingly I got the M102 for what I would consider a reasonable price, usually they have a premium from that stupid movie Eminem made....which really gave 8 Mile a reputation it didn't deserve in my opinion. I have an M85 coming which really just leaves M1/Woodward as the only significant route in the city I need. Basically anything in the green wrapping hasn't been touched in years since I moved back west. Whenever I get closer to rounding out the US Routes I want I'll probably get around to hanging them all in the garage...or as much as I can. I have some US 66 stuff out in the family room, an I-4 hanging above the couch and some California spades in the garage in the moment. Just picked up an M85 or Fort Street/Road from Metro Detroit and the city proper. It even has the MDOT sticker intact, nice little bonus that usually isn't there. I'd personally love to see a more due-north route from Page, AZ north into Utah. I've always been frustrated by the extent of the westward deviation of US89 before you finally straighten out and go north again. Of course, there's a large national monument and a national park separating Page, AZ from I-70 if you draw a line more-or-less straight north. Though I say, let's not get ahead of ourselves and see if we can even establish a two-lane road along that corridor before we consider a full Interstate. Basically I need a US 64 to round out my Arizona US Route collection, I don't think a embossed US 180 (I) or US 260 are going to be out there for anything but the stratosphere. I didn't include State Routes since that would basically include anything from all the states that I lived in or worked in. I'm working on a new catalog of what I have in stock....seemed like it was easier to track what I wanted but didn't have yet. US 6: 12x18 PA Historic Route sign from the Historic US Route 6 club. US 13: Modern 36x36 overhead guide sign. US 19: Overhead sign saying "US 19"
US 24: Modern 36x36 overhead guide sign. US 27: 1926 Embossed Michigan 16x16.5 replica. US 66: 1975 cut-out non-reflective Illionis sign in 1949 style that was given to Illinois Department of Transportation Members. US 71: Green street sign showing "US Route 71"
US 90: Green street sign saying "US 90"
US 127: Modern overhead guide 36x45, my biggest sign. US 202: 18x18 Maine with painted US Route sheild, rusted as all hell. 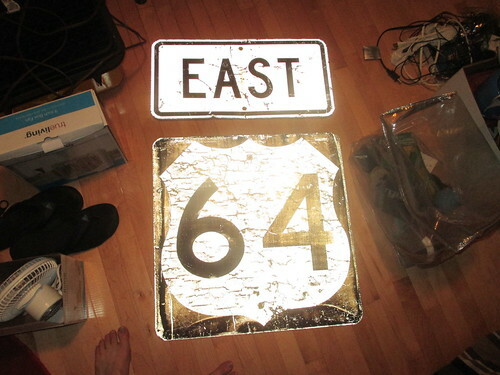 I-35: Overhead guide sign with rivets in it. I-78: On a white 24x24 blank. I-84: From an eastern state, not sure which one. I-94: Weird 18x18 off an overhead guide sign. I thought this one was really cool given the infamy being US 299 from 1934-64. Fun road through the Trinity Range between US 101 and I-5...had a blast up there a couple months back on a road trip.